Would you make a good physician assistant? Take our career test to find out how you match with this and over 800 other careers. What is the workplace of a Physician Assistant like? A physician assistant is a medically trained professional who works under the supervision of a physician, and has the ability to examine, diagnose and treat patients. 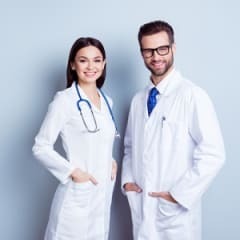 Some physician assistants specialize in a particular area, such as pediatrics, geriatrics, or emergency care, where they can assist physicians with procedures and advanced medical techniques. They are also able to prescribe medication, suture small wounds, interpret medical tests, and prepare splints or casts. In rural or underserved areas, physician assistants are often the patient's first contact for medical care. It is important to note that individuals who are more interested in patient care tend to gravitate towards becoming a nurse, or a nurse practitioner. People who are more interested in diagnosis and treatment gravitate towards becoming a physician assistant. It would be wise to decide ahead of time what role it is that you want, and take the path that will allow you to fulfill that role. Are you suited to be a physician assistant? Physician assistants have distinct personalities. They tend to be investigative individuals, which means they’re intellectual, introspective, and inquisitive. They are curious, methodical, rational, analytical, and logical. Some of them are also social, meaning they’re kind, generous, cooperative, patient, caring, helpful, empathetic, tactful, and friendly. Does this sound like you? Take our free career test to find out if becoming a physician assistant is right for you. A physician assistant can work in a doctor's office, in a hospital, or for outpatient care centres. Work can be demanding, both physically and emotionally, but can also be rewarding when helping patients. Most work full time, are often on call, and may be required to work nights, weekends and holidays.